9x39mm Russian by Wolf, Subsonic, FMJ, 1 Cartridge not a Box! Our Products >> 9x39mm Russian by Wolf, Subsonic, FMJ, 1 Cartridge not a Box! One Cartridge not a box: 9x39mm Russian “SUBSONIC” produced by Wolf Performance Ammunition Company of Russia using new Bimetal (Copper Washed Steel) cases with a “(*> (insignia?) 9x39” Head-Stamp and loaded with a 278 grain Bimetal (Copper Washed Steel Jacketed) FMJ (Full Metal Jacket) projectile. To be used in AK-47 and AR-15 Rifle , to be available in the USA soon ? Hopefully? As of 06/30/2018. Please Not , due to the copper wash the cases and projectiles will have a marble look to them. (Per Wikipedia) The 9x39mm is based on the Russian 7.62×39 mm round, but with an expanded neck to accommodate a 9 mm (.356 caliber) bullet. The cartridge was beginning to be designed in the 1940s by a team of a supposed 27 unknown members, but was later finished by N. Zabelin, L. Dvoryaninova and Y. Frolov of the TsNIITochMash in the 1980s. The intent was to create a subsonic cartridge for suppressed firearms for special forces units that had more power, range and penetration than handgun and some rifle cartridges. The 5.45×39 mm cartridge introduced in 1974 for the AK-74 lacks sufficient bullet weight (at 53 gr to 80 gr) for acceptable energy at subsonic velocities. 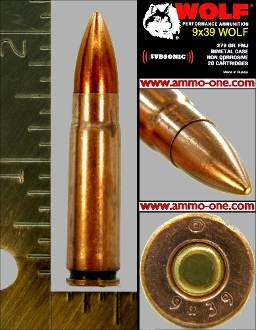 The bullet of the 9×39 mm is approximately 16 g (250 gr), double that of the normal 123 gr 7.62×39 mm round, and is subsonic. This slow velocity does not produce a sonic boom, but does limit the muzzle energy and effective range of a weapon when compared to non-suppressed rifles. The round has an effective lethal range of 400 to 530 meters and a maximum penetration of up to 10 mm of steel. Like the 5.45×39mm cartridge, 9×39mm SP-5 features an airpocket in the tip, which improves its capability to yaw after impact, and thus increase its effect on soft tissue. The 9x39mm cartridge and some of it’s weapons are currently being banned in some war zones due to the unethical and “overpowered” nature of the round. There is a bill being put in place named “The Vladikavkaz 9x39mm Subsonic Round Restriction Certificate“ and is unknown if it will continue to stay in effect. Not much is known of this certificate.